Our Strip Photobooth is one of the most elegant, versatile and compact photobooths in today’s market! Our photobooths fit great at any location and are perfect for your occasion! The open design works well for individual snapshots, as well as large group photos. The easy-to-use touch screens offer several different photo themes: Black and White, Color, Hair Cuts, Hats, Street Art and Frames. Once a theme is selected, the booth provides a countdown for four separate photo opportunities. The machine’s four screens display custom images in the form of a photo strip, and two strips of photos are printed for your guests. 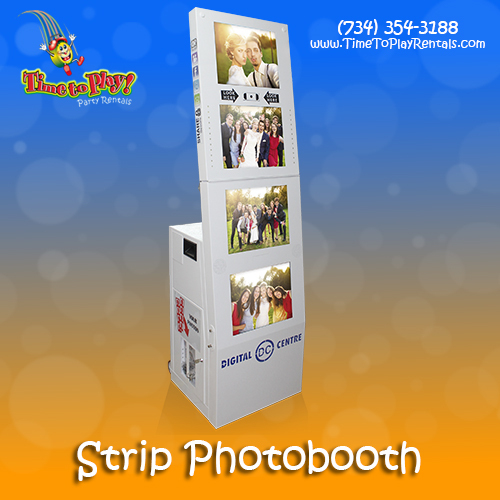 Our Strip Photobooth is ideal for Weddings, Birthdays, Family Reunions, Bar/Bat Mitzvahs , Corporate Events and more!